Description: Smiling manager holding a terrestrial globe with his team working at computers. Business concept. 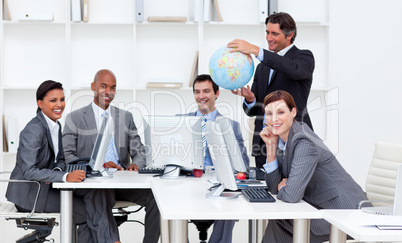 Royalty free photo Smiling manager holding a globe with his team working at compute with a maximum resolution of 5294 x 3198 pixels. The image Smiling manager holding a globe with his team working at compute is one of 23697 photos in the category Menschen and has been part of ClipDealer's stock since 10 Mar 2010 11:59:24. Smiling manager holding a globe with his team working at compute is released for Kommerzielle und redaktionelle Nutzung.